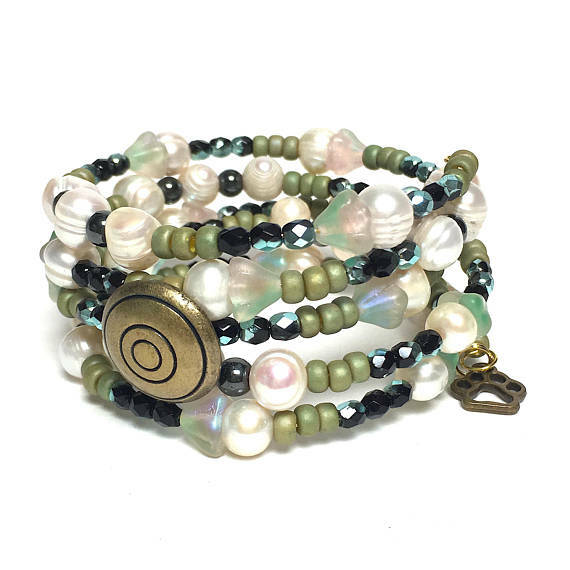 This pretty bracelet named “Tulip” reminds us of the promise of spring and all that blooms. For March, Beading Divas bracelet sales benefit No Kill P.C. Although not a shelter, NKPC promotes the no kill equation by working with the county shelter to improve positive outcomes for shelter pets through sound initiatives and campaigns. 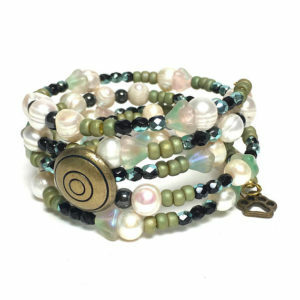 All bracelets are handcrafted, one-of-a-kind and made with donated beads. Bracelets cost $20, no tax. No Kill P.C. receives $20 for every bracelet they sell person to person and $18 for every bracelet sold online. Postage is based on destination. Please note: Bracelets online via Etsy have already been photographed, uploaded, wrapped and labeled. What’s on Etsy stays on Etsy until someone buys it off Etsy. You cannot pick up an Etsy bracelet anywhere because the fulfillment is done by volunteers in private homes. If you like it, buy it – one of a kind — or someone else will. From the Feedback File: “I am addicted to these beautiful bracelets, also addicted to your cause and your profound generosity to each cause. You are a Tucson treasure.” ~ Claire L.
Winston has Megaesophagus. 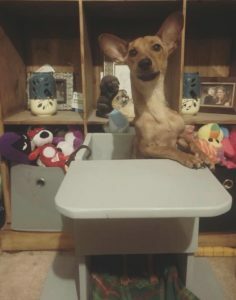 His adopter will receive this special chair (has to eat in the upright position) and personal coaching on how to take care of Megaesophagus. Worthy and Waiting is a NKPC initiative to bring attention to the homeless pets at local rescues/shelters who need us the most. One year old Winston is available through Lil Bit of Love.